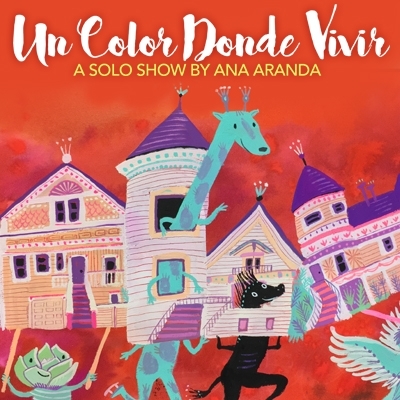 A solo show by Ana Aranda. Colors shelter us, like the home of our childhood. Even though we leave home behind, we carry the colors that remind us of it. With a series of illustrations, Mexican visual artist Ana Aranda explores the meaning of home: its transportability and the fantastical elements that shape it. Ana Aranda was born and raised in Mexico City, where she studied design. From there, she moved to France, where she completed her undergraduate studies in illustration. She now lives in San Francisco, where she obtained her MFA in Illustration. Ana’s work has been featured in galleries and museums in the United States, France, Mexico, and Italy. In San Francisco, she has painted murals in the Mission District, for the Consulate General of Mexico, and for the prestigious de Young Museum. Her illustrations can be found in picture books published in France and Italy. Ana’s US debut picture book The Chupacabra Ate the Candelabra (written by Marc Tyler Nobleman, Penguin Random House) was released March 2017. She is currently working on her second picture book and a picture book that she both writes and illustrates. Her biggest inspirations are her childhood memories, the vibrant colors of Mexico, and music. Her work focuses on transforming the everyday into fantastical situations, and often include images from nature and whimsical creatures.